The U.S. Nuclear Regulatory Commission has scheduled a Jan. 5 public meeting where it will also discuss the reasons behind allowing the plant near Toledo to reopen. The Davis-Besse (BEH’-see) nuclear plant began producing electricity again in early December, less than two months after the cracks were discovered. These meetings are usually not well-attended, and usually feature a panel of representatives of the Utility and the NRC who constantly regale the crowd with carefully worded “facts”, intended to maintain public support. 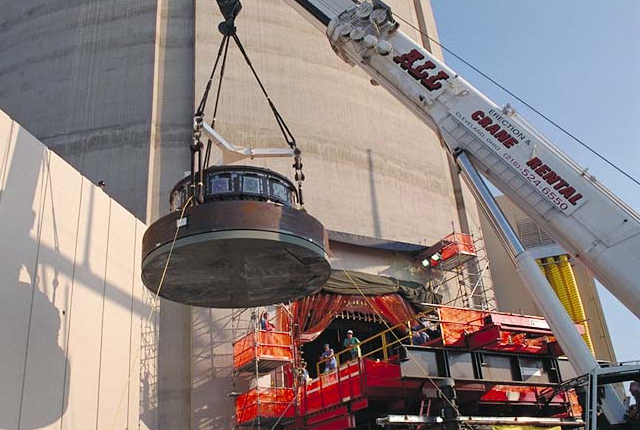 The NRC public meeting is from 6:30 -9:30 p.m. Jan. 5 to discuss its independent inspection of the Davis-Besse nuclear power plant shield building. At the meeting, FirstEnergy Nuclear Operating Corp., the operators of the plant, will explain how they came to the conclusion that the shield building is safe for continued use. The meeting will take place at the Camp Perry Clubhouse, 1000 Lawrence Rd., Bldg. 600, Port Clinton. It will be open to the public, and questions are welcome after the presentations. Those who cannot attend in person can still join the conversation by calling 800-369-1122 and entering passcode 7687149. An informational poster session will also be held before the meeting from 6 to -6:30 p.m. EST at the same location. This session will provide agency information on poster boards and allow those in attendance to discuss topics on a one-on-one basis with NRC staff. Ohio Congressman Dennis Kucinich (koo-SIN’-ich) criticized the decision, saying that it’s still not known what caused the cracks or whether it’s a bigger problem. Congressman Dennis Kucinich called for such a hearing. “The NRC is right to give the public the chance to ask questions of FirstEnergy and the questionable structural integrity 0f Davis-Besse. I have uncovered significant new information which has raised new questions about the cracks in the shield through my own investigation and look forward to a frank discussion with FirstEnergy on January 5,” he said, in a news release. Kucinich’s Congressional district was eliminated with redistricting. He plans to run in the Democratic primary in the Ninth Congressional District, challenging incumbent Rep. Marcy Kaptur, D-Toledo. According to Kucinich, the outcome of this and future meetings could include repair orders. Kucinich said the cracking issue is an important one, and very technical. Keegan said he expects about 30 people from his group to attend. Other interested groups include Beyond Nuclear, Citizens Environment Alliance and the Ohio Green Party.